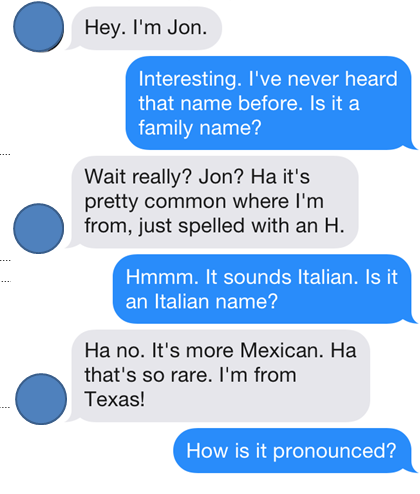 It Just Gets Stranger: Is Jon Really A Common Name? I'm not totally sure whether what the kids are calling "the Tinder" is still a popular thing among the kids. I know it was a year ago, and I'm told that people are increasingly abandoning it for other dating apps. But I don't know what they are going to now because it takes 18 to 72 months for me to find out what the kids are doing and not enough time has passed yet. In any event, messing with people on Tinder is still one of my favorite pastimes. What can I say. It keeps me young. One of my hobbies (when I'm not too busy brushing my hair, looking into the mirror, and telling myself how pretty I am) is taking my friends' phones and Tindering on their behalf. I wish there was some way I could make this task my full-time job. In fact, since there's no time like the present, I'm just going to go ahead and pitch my new business idea: come and drop your phone off at my house and let me Tinder for you. I take payment in hugs and compliments. And when that doesn't pay the bills I'm going to need you to give me money too. Or bail me out of jail when I turn to illegal acts. Like the Macarena. I should probably warn you that if you do have me Tinder on your behalf, there is exactly a negative eleventy million percent chance that you will ever find love. Hiring me for this service would basically be like having your grandma go on your dates for you. And not just because we both wear Depends. 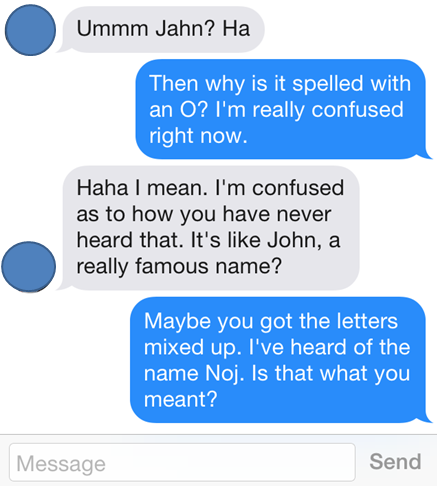 I've shared a few of my favorite Tinder moments with you in past here and here. And recently, by the good graces of God, I had a wonderful exchange on behalf of a friend with someone named Jon. WHICH I'M STILL NOT CONVINCED ISN'T A MADE UP NAME! Come on "Jon." At least provide a pronunciation guide if you're going to go around claiming that that's your name. DID HE REPLY????? HOW DID IT END????? I MUST KNOW! I think it might be a Norwegian name. Maybe you should get back in touch and ask him. "My 92 year old father keeps asking me the difference between a facebook and a twitter. I've tried to explain social media to him but he current believes that facebook is a type of laptop computer brand and twitter is a type of cell phone, he wants one of each. Recently my niece was talking about tinder and after she left my dad asked me what you could possibly need kindling for on the internets." Haha! This is amazing. My grandma called it Twinter last month. We still aren't sure if she was referring to Tinder or Twitter because her statement was, "everybody wastes time on Twinter reading jokes and hooking up and nobody goes out anymore." That would be the best job ever. I'm still a little confused about how you pronounce it. I was asked by a young guy how to spell my first name. I said "R-E-B-E-C-C-A" and he said "Huh. That's different." NO! NO IT'S NOT! IT'S COMPLETELY NORMAL! LOL...awesome...all of it. If you hire me into your new business I'll be one of you "idea guys". You can pay me in jelly beans. Jelly beans and mashed potatoes. Will you take pinto beans? Or do they have to be jelly? I found a great deal on pinto beans recently so I have a lot of them.